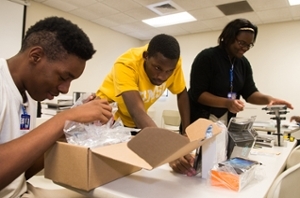 High school students in Southern Illinois University Edwardsville Upward Bound EC (East St. Louis and Cahokia) and BEM (Brooklyn, East St. Louis Charter and Madison) programs are learning how to build robots, about computer coding and how to protect technology from cyber-attacks. 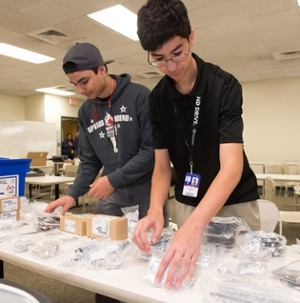 For the first time, Upward Bound is offering FIRST Robotics, Code Red and CyberPatriot to its students to better prepare them for college and careers in the field of STEM (science, technology, engineering and math). “These new classes are part of our effort to provide learning experiences that are highly engaging, and at the same time prepare students with skills for college and career success,” said Jesse Dixon, executive director of the SIUE East St. Louis Center, where the Upward Bound programs are housed. “Our students are interested in STEM education and careers. They have already shown aptitude in related fields, and we want to encourage them to advance their knowledge and skills,” said Upward Bound EC/BEM Program Director Javonda Quinn. “These courses will be taught all school year and at different times, to make it possible for one student to attend all three classes. All three courses are being taught by new Upward Bound EC/BEM STEM instructor, Jay Hubert. “Our classes began Sept. 27, and I can already tell that there is a high level of interest and excitement among several of the students,” Hubert said. “I like the idea of robotics and wanted to get a more extensive and educated view about it,” said Marjea Ward, 16-year-old Upward Bound EC student. “I’m already taking the Code Red class.” Ward plans to earn a master’s in business administration marketing. The FIRST Robotics class brings all four STEM fields together. “Using a scientific approach, students will construct, operate and control a robot to complete a challenge that they design,” Hubert said. Getting started on their robotics class assignments are Upward Bound EC students (left to right): Devin Washington, 15; Edgar Williams, 18; and Kierra Montgomery, 14. Arranging their inventory are Upward Bound EC students Zachary Riggs, 17 (left); and Alex Gomez, 15.